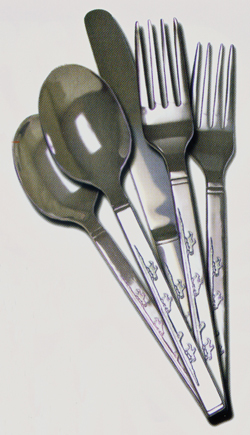 Stainless steel Cowboy Flatware makes food handling safe. 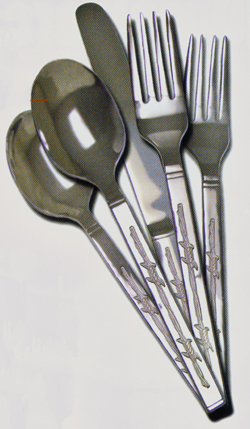 The styling chosen by Moss Brothers is more reminiscent of real Western knives & forks. 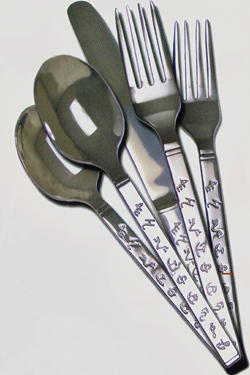 Details are seen, but not so deeply engraved as to create bacteria issues. 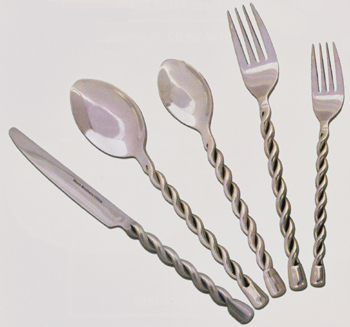 These look great when added to your ranch styled stoneware. OK, More savings! 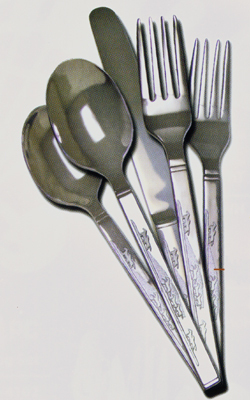 Order your ranch flatware sets 2 at a time and save another 5% off these shown Cowgirl flatware prices. And shipping on 2 sets is about the same as shipping on 1 set. 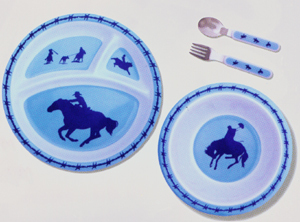 And for those little cowboys and cowgirls Moss Brothers offers matching dinner sets. Complete with a segmented plate, matching bowl and matching utensils. How cute can you get? Melamite is well known for being sorta "toddler proof". Plates with dividers make it easier for the little cowpokes to keep food on the fork & into their mouths instead of all over the floor. I find that if Ariella & friends are not frustrated, they eat the food rather than throwing it. Make meals fun! 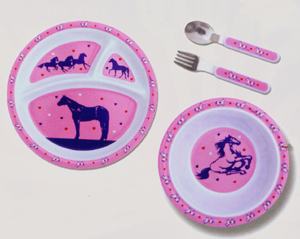 Also a great gag to serve a birthday adult from this child's horsey plate and bowl set.